“If you were committed to a psychiatric institution, unsure if you’d ever return to the life you knew before, what would you take with you? 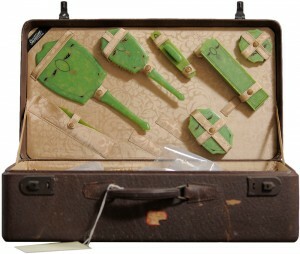 That sobering question hovers like an apparition over each of the Willard Asylum suitcases. From the 1910s through the 1960s, many patients at the Willard Asylum for the Chronic Insane left suitcases behind when they passed away, with nobody to claim them. Upon the center’s closure in 1995, employees found hundreds of these time capsules stored in a locked attic. Working with the New York State Museum, former Willard staffers were able to preserve the hidden cache of luggage as part of the museum’s permanent collection. For the complete article click here to go to Collector’s Weekly. A Haunted Ancient Egyptian Statue? 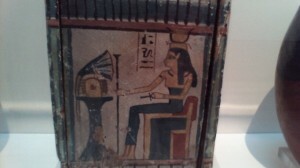 Why is this Egyptian listening to a record player and holding a remote control? Is this merely a lotus and an ankh? And what’s this? 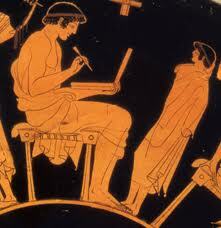 A laptop and a stylus? Emily K. Editor on 24 Jun 2013 | Ancient Wonders &Audio & Video &Mysterious History &Mysterious News &Mythology &Near Death & Reincarnation &Oddities &Paranormal &Religion & Spirituality &Science & Research &Uncategorized | Comments Off on A Haunted Ancient Egyptian Statue?